Today we will discuss a very powerful feature of Java i.e. ?Exception Handling?. In this particular blog we will see; ?What is Exception? ?, ?Types of Exception?? and ?How to handle Exceptions in Java??. Before we start lets first discuss something about Exceptions and Error and their hierarchy in Java. An Exception is an unwanted situation or event that occurs during the execution of a program, exceptions may lead to termination of the program if not handled properly. Whenever an error occurs within a Java code on runtime, an Object is created called Exception Object, it contains all information about exception including type or class of exception and the location where the exception is occurred in the program. Java run time environment searches for an appropriate handler for this exception object, it starts searching from the current method to calling methods in reverse and at last the main method. If an appropriate handler code is found then the exception is handled normally, otherwise program terminates. Event handling is a mechanism that provides handler code snippets to the program, so that the exceptions can be caught and programming flow can be maintained. The exceptions that are not checked at compile time are called unchecked exceptions, classes that extends RuntimeException comes under unchecked exceptions. Examples of some unchecked exceptions are listed below. Mathematical operations that are not permitted in normal conditions i.e. dividing a number from ?0?. Trying to access an index that does not exists or inserting values to wrong indexes results to ArrayIndesOutOfBound Exception at runtime. Trying to access a null object or performing operations on an object having a null value. 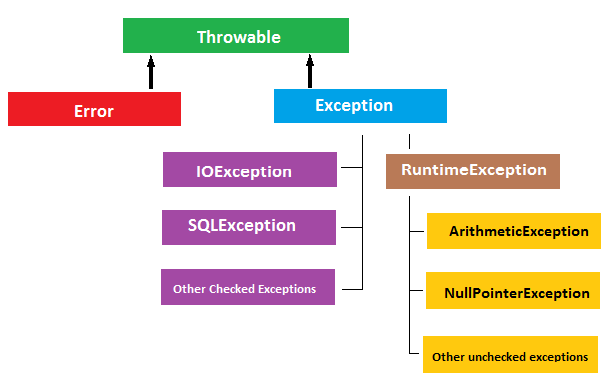 Exceptions that are checked at compile-time are called checked exceptions, in Exception hierarchy all classes that extends Exception class except UncheckedException comes under checked exception category. While writing a code to read or write something from files or even from or to console, an checked Exception i.e. IOException is thrown, these exceptions are checked at compile time and we are forced to write a handler at compile time. That?s why we called these exceptions Checked Exceptions. We will know about try-catch and other Exception Handling stuff in next blog. We will cover this part in Next Tutorial in details. In this particular blog we came across the basics of Exception Handling and What is difference between Checked and Unchecked Exceptions in Java language, in next blog we will cover exception handling strategies using try, catch and finally.